This will be a relatively personal blog, but don’t fret, I’ll get back to my normal limited experiences later. If you’re here just for magic, just skip to the last paragraph. I have been away from home for several years and being an expat is indeed a difficult task that has tested a lot about who I am and at times, I felt like the challenge was insurmountable. I remember how alone I felt at times and how my terrible language skills alienated me regardless of how often I tried to communicate in Korean. 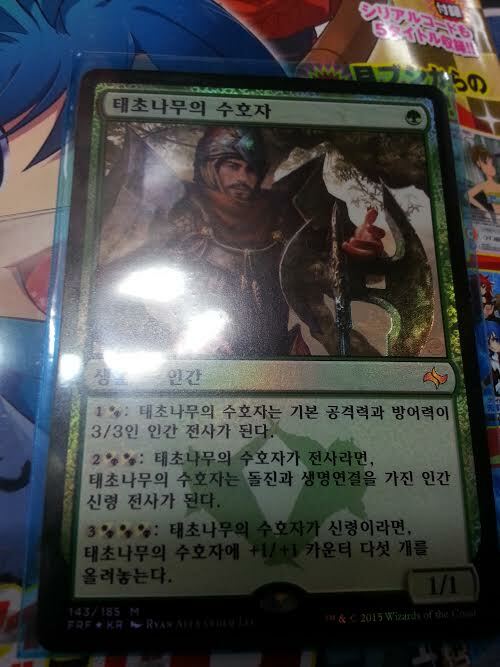 Then, I went into my first card shop in Gangbyeon. I befriended an awesome shopkeeper, Michael, and met friends I still have to this day. Magic didn’t just give me friends though, it gave me a community. The competitive people pushed my magic abilities as well as giving me that sense that I do belong, breaking barriers of language and culture. I couldn’t have asked for anything more. The people I have met playing magic, both Korean and fellow foreigners, have been some of the best and I’ve always been very thankful for that. With just some months left before I leave this country, I’ll be spending my remaining time going to shops throughout Seoul. 2[W/B][W/B]: If Warden of the First Tree is a Warrior, it becomes a Human Spirit Warrior with trample and lifelink. At one mana it brought back all the memories of the old Figure of Destiny. It had quite the reputation to live up to. Personally, I wished the second ability boosted its stats or at least gave it a relevant ability like Hexproof. However, a second glance, shows that this doesn’t work the same way Figure did. If the old kithkin went unchallenged, it’d grow and let the player keep valuable creatures in hand to be unleashed should the figure meet his final destination. 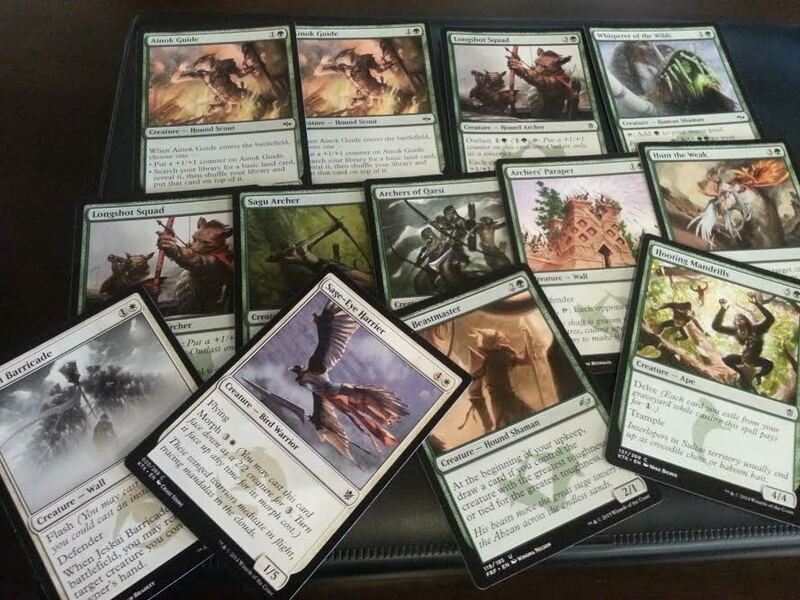 Instead, this is meant to be a threat that grew with the likes of other Abzan creatures. While not a gamebreaker, it still feels like a solid card. I was quite excited to open a foil version. Regardless of its low price now, I still think it’s a special card with fantastic art. Anyway, this was the card that brought me back from my magic hibernation. I went to my first draft and I had big hiccups. 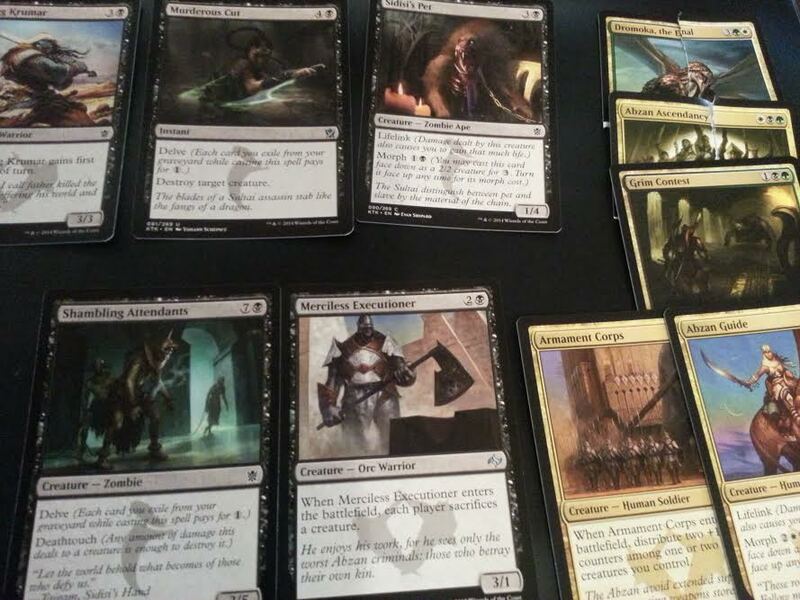 The biggest issue with going with Abzan was that.. everyone seemed to go into white and black. There was a huge blue signal and I’m not sure why I didn’t go into blue. On the second pack, I even managed to open a Sarkhan, but I still kept staying on my first pick, a green/white dragon that while is a great bomb, influenced my future picks so much that I ignored good red cards like Pyrotechnics and Bathe in Dragonfire. Being out of the game and not really focused cost me a match as well. However, it was nice being able to play and I look forward to my drafts against Korean players next. I loved playing Magic in Korea. The shop in Gwangju and the friends I made there I still communicate with them from overseas, and if I had the chance, I would definitely revisit them, despite not being able to speak Korean at all, really. The shopkeepers are the backbone of the community. I think wizards knows that and it’s always why I try to support them as much as I can. I still remember how the shopkeeper in Gangbyeon did shots with us during my first midnight prerelease in Korea. We talked and chatted for hours and I didn’t care at all that I went 1-4; it was one of the best times I had in Korea.